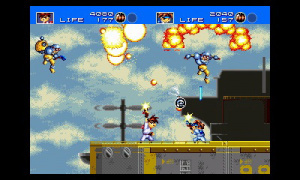 Gunstar Heroes charged onto the Sega Mega Drive in 1993, significantly marking the début of quirky developer Treasure - having been formed from ex-Konami staff wanting to go it their own way. Often seen floating near to the top of many 'best game ever' lists, Gunstar Heroes is a bona-fide classic of the 16-bit era that's now available to download from the 3DS eShop. 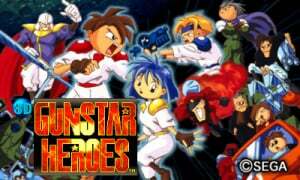 As 3D Gunstar Heroes is part of Sega's 3D Classics range, the porting duties are once again handled by the experts at M2 who've poured all their usual love, care and attention into this new version. In all fairness, a straight up port would have been just fine; Gunstar Heroes pushed the limit of what could be achieved on Sega's then-ageing console, bringing with it a plethora of incredible graphic effects that many didn't think possible. Together with Treasure's unique graphic style, explosive pyrotechnics and not a hint of slowdown, it's easy to see how Gunstar Heroes wowed gamers back in the day. 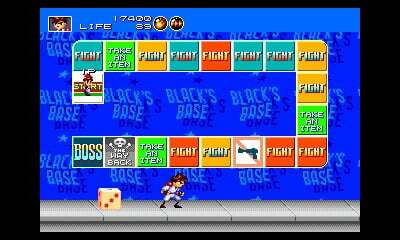 Thankfully, Gunstar Heroes looks just as impressive now on the screen of a Nintendo 3DS, the resolution seemingly a perfect fit for emulating Megadrive titles. Switch up the 3D slider and it's immediately clear that M2 thought long and hard about how to retro-fit a stereoscopic effect; most of the time it's quite subtle, but every so often it can be really striking. As an example, during the climb up (and sliding down) of the block shaped steps of the first stage, the sense of depth is fantastic and much more pronounced. For a game that's largely 2D, it's a wonderfully considered implementation. As usual M2 has added in a fair few extra options and modes, such as emulating the look and feel of old curved CRTs; however note that there isn't a widescreen option - the game is viewed in 4:3 ratio at all times, (which is also the case with the other Mega Drive 3D Classics). You can even switch between International and Japanese game versions should you so wish. The storylines are a touch different in translation, but in practice the actual game itself is identical. 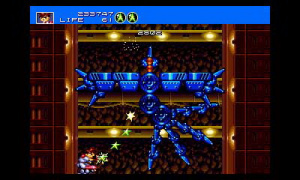 One of Gunstar Heroes' key gameplay features is the ability to combine the abilities of the two weapons you're carrying in order to create a hybrid. M2 has added a new mode (named 'Gunslinger') that enables the player to permanently hold all four weapon types in both weapon slots, cycling through them with either the left or right trigger. This effectively grants access to all weapon combinations instantly; normally you are restricted by weapon drops and only being able to carry two types at any one time (note; you can carry two of the same type). This actually changes quite dramatically how you approach the game; being able to instantly swap to any attack of your choosing creates many new strategic options. As well as your increased arsenal, a quick press of the 'x' button swaps between free shot (aim your shots while moving) or fixed shot (locked to a standing position while being able to fire in all directions) giving you even more offensive options; usually you have to choose between one or the other at the beginning of the game. Another way in which Gunstar Heroes differs from most other run-and-gun shooters (such as the Metal Slug or Contra series) is the use of a life system. When hit you don't die instantly; instead a chunk of life is lost from the meter. This helps Gunstar Heroes feel much more accessible than other games in this genre where one hit deaths can make for a swift game over. M2 has added the option to double the number of your starting life meter from 100 to 200 (the appropriately titled 'Mega Life Mode'), however make no mistake it's still no push-over. That said, combine Gunslinger Mode with Mega Life Mode and suddenly the end game seems much more achievable for new players - especially when used in conjunction with the save states. 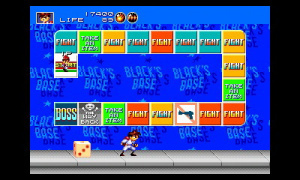 What's truly impressive about Gunstar Heroes is the variety contained within its classic run, shoot and jump formula; there are many twists and surprises, including a brief spell as a 2D 'shmup' and the infamous Black's dice maze, which sees the player having a quick bout of Mario Party board game madness, throwing a dice to find out their fate. Gunstar Heroes is a superb tour-de-force of variety, incredible graphics and a fittingly rousing soundtrack that also happens to be an absolute joy to play in both single and co-operative play. I'm really looking forward to finally being able to play this. This game sounds so incredible, and I never got the chance to play it back in the day so this is the perfect time to try it out. All of the added features sound splendid as well, especially since I'm not an enormous fan of 2D action games. The added life gauge option and weapon combination changes will make this a MUCH more enjoyable experience for me. I'll definitely be getting this game soon. This was Treasure's first game? Whoa, talk about starting off with a bang! Loved this so much as a kid, a sequel with online co-op would make me so happy. Man after reading this review I feel like I have been missing out all of these years! This may be the first 3D Classic that I buy, though I want many of the other ones too! The original version is still in my classic gaming arsenal on my original Wii and it's one of the best "golden era" run & guns for the Genesis. The sequel on the GBA is one I still play often as it lends itself very well to the "pick up & play" design motif for handheld gaming. That game in my backlit GBA SP is almost what the game would have been like if it were a SNES exclusive using a Super FX2 chip. Many of the same levels as the original Genesis game (including some flashback scenes) just playing like half directors cut and a sequel to this classic which I highly recommend it to everyone! I have the enhanced GBA version so it's a toss-up to get this one for 3D or play the GBA remaster with updated sprites. I guess this is a good a place as any to start with this series. Glad someone is taking the 3d classics series seriously! If not for these classics I doubt I would even bother with Sega games. From Gunstar Heroes to Sin & Punishment 2: Star Successor, Treasure has been making great games for decades. For those just starting the game: make sure to combine homing and lightning ASAP. It is the way of the champions. It really bugs me how we need two copies of the game to play multiplayer. You only needed one on the MegaDrive! But thanks for the review, seems like Sega and M2 are really picking the cream of the crop with this 3D Classics collection. Might wait for a sale and buy it for a friend as well. @Dpishere You have been! My personal favorite Genesis game. And, if you like this game and you have a wii/wiiu, I strongly recommend alien soldier. It's another treasure genesis/mega drive game but was exclusive to Japan until the virtual console came along. Nintendo needs to hire M2 once Sega is done with them. The 3D that's been implemented can't be praised enough. Games built from scratch for the 3DS don't do the 3D as well as this game which is a technical marvel of emulation and porting programing before you even get to the 3D. It really can't be overstated the work and sheer passion M2 put into this game that they weren't even tasked by Sega to do. The quality and even the existence of this product exceeded the order in this case, all in the name of retro glory. So go buy this game! I guess I'll bite for this one...I probably won't mind too much paying again for a VC release. Heh, at least you guys get to see what inspired part of freedom planet! Edit: wow the 3d effects from the videos looks nice! Gunstar Heroes is the shooter genres Ocarina of Time. I'm sure that purchasing a 3rd copy isn't going too far, though I would LOVE for it to become the best selling VC game ever. Let's face it, there are so many more fantastic Treasure games out there that would work wonderfully on current Nintendo systems. Like Sin and Punishment for the Wii U / 3DS where shooting and movement is done using the sticks and shooting / melee is done by swiping the screen. I would almost kill for new Treasure or remastered or remixed or rereleased Treasure! I'm kind of obsessed with their games..
3DS can always use more run n gun platformers. One of my favorite genres, glad to see a sort of resurgence in the genre lately with games like Broforce and Gunman Clive coming out as well. Also, please put Broforce on 3DS or Wii U. I need that to happen. When I played Gunstar Heroes for the first time, I wondered how was it possible that everybody didn't try to make games as amazing as this. Dynamite Heddy next! I might just get this, especially if my cousin decides to pick it up, too. Would really enjoy playing it with him. I'm at the point where all I have to read is 'M2' and I'm on board. These dudes need to keep turning out awesome ports. Nintendo could revive their 3D Classics line in no time with these folks at the helm. So much fun! I've been waiting years to play this game & it's just as amazing as I'd hoped. Thanks SEGA, M2 & Treasure! As DreamOn and Morph said, the 3D is AMAZING and it stays in focus a lot easier than many other 3D titles. ( I have the regular 3DS XL) I have played the original game over and over again but the 3D really stands out to make this the definite version of the game. Do yourself a favor and complete the experience buy using headphones when you play. 3D and 2D shooters go hand in hand like peanut butter and jelly! This is why I hate review scores. Even in isolation of the knowledge that this is the best game in its genre - there is not a negative word in this review. There is nothing in the text to suggest what it is about the game (or the port) that the reviewer believes holds it back from that hallowed '10'. @Moon the SEGA 3D classics are the cheapest games on the eShop, AND your friend will be able to play without yo-- aaah, is that what your worry is? That they would play someone else if they had their own copy? @JaguarWong the lack of a fullscreen mode, I believe, was mentioned as one drawback. Ah, true. I guess i missed that as a negative because I believe presenting games created in 4:3 in their native resolution is a good thing. Does NL give 10s for non- Nintendo games? Anywho... I don't think I've ever played this so I'm buying. Im sorry but this is clearly a 10 as a standard release for the MD let alone the 3D update and attention/options etc M2 have put into it 9 isn't right at all. That has nothing to do with the score mate, that's a problem with the review itself. Downloaded it last night. Had a little trouble with the controls at first but I think that's cod I was still getting to grips with the mechanics (or I may have accidentally pressed X). The 3D was also a bit wonky but that's cod I was using the stabilisation system of the N3DS in a dark room (I notice it tends to have trouble keeping things in focus). In short I need to give it another round but I remember it being tonnes of fun on the Wii. i kinda get it when people say it expensive for what it is, considering the pricing of other sega classic collections. However what your getting easily justifies the price all these 3D classics easily are the definitive versions simply because of loving detail M2 have put put into these remakes. The gigadrive architecture they built for the megadrive games is awe inspiring, it show what 3ds is cable of. Make no mistake these are not simple emulator these are rebuilt from ground up. One attention to detail is the sound especially because of the difficulty of emulating the sound synthesiser of the mega drive i haven't seen a emulator that dose a good job of it, M2 however absolutely nailed it shows how they strive not just to get the game working but also to get it working accurately. make no mistake these just aren't simple ports they go far beyond at £4.49 these are easily a steal. its just a shame it stops after sonic 2. So, what held it back from getting a 10? @Noelemahc It's not really mentioned as a drawback, more just an observation. @JaguarWong 4:3 is a good thing, not a negative. Would have been nice with the extra graphics drawn into the edges (for an option) as M2 did with Out Run and a few of the others though. Had it on the Wii VC already. Very entertaining game, though not too memorable overall. Better than its GBA sequel. It would also be nice if M2 did Dynamite Headdy. One of the best action games I know. Now I just want to see a third Sin & Punishment game on NX. THIS IS SEGA!!! What a classic!! Everybody should support these sega 3D classics so they keep on coming! And yes even though this is a 20+ year old game it can stand toe to toe with any high end indie action game today!! This is why Nintendo pisses me off with the Wii U vc!! Such a missed opportunity there with sooo many awesome classics missing!! Thanks to the Sega I know and love!! I bought all the sega 3D classics and will continue to do so if they keep coming!! Golden axe- toe jam n earl- kid chameleon - sports talk baseball - phantasy star - thunderforce 3&4- virtua cop 2- sega rally- virtua racing- quartet- zaxxon- Congo bongo- turbo outrun- carnival- power drift- castle of illusion-Alex Kidd- columns- Daytona USA!!!! Bring em on boys!!!! Talk about missed opportunity. Snes or GBA 3d classic's could possibly sell as well as the mega drive 3d classic's. It seems the big N doesn't think it's worth the resources. WOW this isn't LOOKING good 2 days later and this review has only generated 47 comments. 5th time buying this game! Still worth it! Yes, I got this game around when it first came out (After Xmas along with a decent brawler called Cyborg Justice, Ex-Mutants, Splatterhouse 3, and Ranger X, All $20-$30 deals at Meijer). Square Enix, let these guys make a new or remastered version of Mischielf Makers please? I would love M2 to make some SNES 3D remakes,Just as a example imagine how cool the Boss fights in Super Metroid would look in 3D. All of the M2 games I want are better with friends, and none of mine have a 3DS or like to play 4th generation console games anymore. Otherwise, all of the Streets of Rage games (a trilogy pack would be appropriate if the third game gets ported over too) and Gunstar heroes for sure. The only other game I would buy from M2 regardless of multiplayer would be any of the Road rash games, but I can understand completely why those wouldn't be '3D-ized'. This game is really fun! Hard but fun! Sure it isn't 10/10? What held it back? Is this 3D enhanced port keeping all the guests from outside licenses? Or is it like the GBA game, where it was gone. I would love to see Gladys and her two men (Fushigi no umi no Nadia) again. Could anyone who "owns" this version bring me an answer please ?